A mental health expert at Saint John of God hospital in Mzuzu says Malawians need to have the spirit of respecting mentally disturbed individuals because they also deserve dignity. Clinical psychologist Ndumanene Silungwe made the remarks during this year’s world mental health commemoration which was held at Doroba community ground in Mzimba on Saturday under the theme ‘Dignity in mental health’. Silungwe noted that a majority of mentally challenged Malawians are neglected by their kinsmen in the country. He said that some people are of the view that the mentally challenged are agents of evil spirits and have nothing to offer in humanity. “Saint John of God mental hospital is accessible, we are here to help such people for free,” said Silungwe. Silungwe also told the gathering that mental illness is treatable and can be cured. He said that many people who once suffered from the disease have testified on how they have been assisted back to normality by the same facility. “In Mzuzu main market we have some who are now making it in business. In various colleges we can point some who were once mad but now are normal and promising to be productive citizens,” said Silungwe. The psychologist urged people who have mentally challenged relatives to take them to Saint John of God for treatment. Speaking at the event, Inkosana Kamkhoti Sibande hailed Saint John of God for helping in the reduction of mental health problems in Doroba. Sibande revealed that before the coming of the organisation, many people were mentally challenged in his area. However, at the moment he boasted that many among his subjects are very industrious. “Unlike that time, this time majority of my subjects are productive because I always encourage everyone with mental problem to consider seeking medical help at Saint John of God,” Sibande. Mental health issues aught to be part of school curriculum. Young school children are the worst culprits where abuse of people with mental problems are concerned. 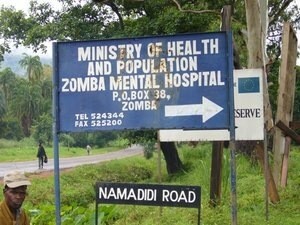 Thsz the same hospital whose management advised Malawi govt to build more Mental hospt. These officials are also mad plz recheck on them. Nanga atayamba kumenya wanthu tizimulemezabe sichoncho?